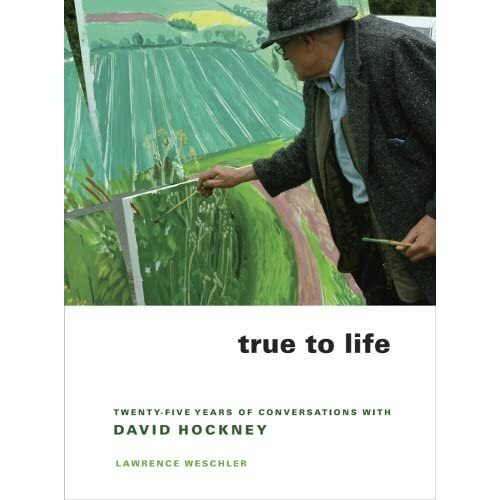 “True To Life”, by Lawrence Weschler, Director of the New York Institute of the Humanities at NYU is an inspiring and interesting book about David Hockney, renowned contemporary artist. Is this a book about his work? Yes and no. It does talk about his paintings and art but in a more profound way then we are accustom to encounter books about artists. We often go to shows or see the work of other artists in various venues but are rarely privy to the machinations that lead up to the finished pieces. After all, none of us want to see the sausage being made, do we? Here, the answer is definitely yes! All the juicy bits are exposed, the deliberations laid bare and the fascinating and complex interplay of an artist in deep contemplation of what art and being an artist means offers us an exquisite and unique view of the genius that Hockney is. You will be delighted with the intensity of Hockney’s inquisitive mind and the path he follows as he unravels the common threads of Cubism, photography and the secrets of Renaissance masters. ← Team EBSQ-Etsy “Must Have” Monday! Thanks, Robin, I always like to read art book reviews written by artists; that way it’s easier to know whether I will like the book or not. I will put it on my want to read list.